Of all the great opera composers Puccini ranks as the highest in the hearts of many people; not just opera audiences but those who have heard his arias on adverts or Classic FM, or as soundtracks to films. Italian football fans may draw on the inspiration of Verdi to suggest the physical might of footballing competition, but it was the BBC’s use of Luciano Pavarotti's 1972 recording of Nessun dorma (None shall sleep, from Puccini’s opera Turandot) that, as the theme song for the coverage of the 1990 FIFA World Cup, captured the passion of the game and the hearts of millions. Beauty and unashamed romanticism runs through all of Puccini’s operas, from Se come voi piccina from Le Villi to O mio babbino caro from Gianni Schicchi. But of the 13 operas that the composer created, two are amongst the most popular of all – if not the most popular – with the audiences today: La bohème and Madam Butterfly. Both capture the tragedy of a heroine in heart-breaking arias and unforgettable motifs. Yet Puccini’s heroines were never one-dimensional. Like Wagner, Puccini dealt with love; but on an emotional level rather than an ideological one, making his approach more realistic (Verismo). And this, I believe, is why Puccini is so popular. But however beautiful the singing; however great the music, it is the overall production of an opera that makes for a celebrated experience. This production, from Welsh National Opera has seen over 200 performances since 1978 and is probably the best British production you are ever likely to come across. Seeing this Butterfly is like catching up with an old friend. I have seen this opera about six times and three of those occasions were this WNO production. This production is set in the original period, and opens with a Japanese house with three shoji (screen doors) that become an important prop throughout the opera. U.S. Navy Lieutenant B. F. Pinkerton (Gwyn Hughes Jones) inspects the house he has leased from a marriage broker, Goro (Phillip Lloyd Holtam), who has just procured him three servants and a geisha wife Cio-Cio-San (Cheryl Barker), known as Madama Butterfly (Questa è la cameriera /che della vostra sposa/fu già serva amorosa /Il cuoco... il servitor... /Son confusi del grande onore..). 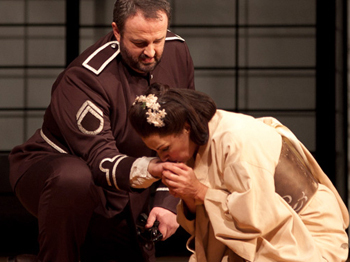 The servant, Suzuki (Claire Bradshaw), annoys Pinkerton by her chatter and Goro claps his hand to send them away. Pinkerton asks about Cio-Cio-San’s family. Goro as the American Consul and friend of Pinkerton, Sharpless (Alan Opie) arrives, breathless from the climb up the hill to meet them. Pinkerton tells his friend how he bought the house on a 999 year lease with a monthly renewal option. He is enchanted by Cio-Cio-San and brags about the life of the American mariner (Dovunque al mondo lo Yankee vagabond/si gode e traffica sprezzando i rischi). What is interesting here is the use of musical styles. Puccini was very much taken with oriental music (Chinese/Japanese) and incorporated the styles into this opera. The Japanese characters are each given a motif or sing in a music that suggests orientalism, whereas Pinkerton and Sharpless are identified with a very definite Western sound. This paints Pinkerton as an arrogant braggart, and that would be the impression we would get in our contemporary times - though less embracing of modernism I think. There is definitely an air of Pinkerton lording it over the, almost feudal culture he sees around him. 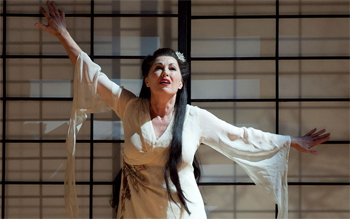 And yet, later in the opera, Butterfly sings of her desire to escape the confining atmosphere of Japanese tradition. Sharpless warns Pinkerton that Butterfly may take her vows of marriage seriously, but Pinkerton brushes his concerns aside, saying he will one day marry a "real" American wife (E al giorno in cui mi sposerò/con vere nozze a una vera sposa Americana). In the distance we hear (Io sono la fanciulla più lieta del Giappone, anzi del mondo). Surrounded by friends, Pinkerton enters and tells how, when her family fell on hard times, she had to earn her living as a geisha (Nessuno so confessa mai nato in povertà). Her relatives enter, expressing their opinions on the marriage. Cio-Cio-San shows her bridegroom her few earthly treasures and tells him of her intention to embrace his Christian faith (È mio destino. Nella stessa chiesetta in ginocchio con voi pregherò lo stesso Dio. E per farvi contento potrò forse obliar la gente mia). The Imperial Commissioner performs the wedding ceremony, and the guests toast the couple. The celebration is interrupted by Cio-Cio-San's uncle, the Bonza (Julien Close), a Buddhist priest, who bursts in cursing Butterfly for having renounced her ancestors' religion (Kami sarundasico!). There is confusion over this statement as there is no understanding of what it means either in Italian or in Japanese. It has been suggested that it could possibly be a misheard pronunciation of Sarudahiko (literally “Monkey man” (see SARUTAHIKO for explanation). Sarudahiko is one of the deities of Shintoism and would not be used by the Bonza, a priest of Buddhism. Pinkerton sends the guests away. Alone with Cio-Cio-San, he dries her tears, as they join in one of the most beautiful moments in this opera. A comparison can be made with the third act duet between Rodolfo and Mimi (Che? Mimì! Tu qui?) where the lovers swear their feelings for each other and yet we know that there is no future for them. This is such a beautiful and tender duet that we forget what we know and can only feel joy at the promise he makes to Butterfly (Ah! vien, Ah! vien! sei mia! ): that he will return when the robins build their nest (il pettirosso rifà la nidiata). Act 2 (Scene 1); and it is three years later. Butterfly waits for her husband's return, as Suzuki prays to her gods for aid. When the maid shows her how little money is left, Cio-Cio-San urges her to have faith: one fine day Pinkerton's ship will appear on the horizon (Un bel dì, vedremo). This is probably the moment that as an audience, we anticipate. It is a beautiful aria in an opera replete with sumptuous melodies, arias and duets. Baker sang it wonderfully, but this opera doesn’t hinge on one aria. For me it was the summation of her singing so far in this wonderful production. Sharpless brings a letter from the lieutenant, but before he can read it to Cio-Cio-San, Goro comes with a suitor, the wealthy Prince Yamadori (Alastair Moore). An exchange of views occurs. Yamadori has had other wives and has divorced them all, he says how easy it is to simply up and leave them. Butterfly, contemptuously responds: La legge giapponese non già del mio paese, and when Goro enquires which country she is referring to, she tells him The United States. She dismisses Japanese law and tradition with the same contempt that Pinkerton does at the beginning of the opera, and points out that wives have a voice in the USA (Sono seccato del coniugato!). When they are alone, Sharpless tries again to read the letter and suggests Pinkerton may not return. Butterfly proudly introduces her son, Dolore (Trouble), saying that as soon as Pinkerton knows he has a child he surely will come back; if he does not, she would rather die than return to her former life. Sharpless, unsettled by her outburst, leaves without having revealed the full contents of the letter. Butterfly is on the point of despair, when she hears a cannon; seizing a spyglass, she sees Pinkerton's ship entering the harbour. She orders Suzuki to help her fill the house with flowers (Una nava da guerra... Scuoti quella fronda) and once again we hear the melody of Un bel dì, vedremo. As night falls Cio-Cio-San, Suzuki and the child begin their vigil. What follows is an intermezzo, with a beautiful opening before a chorus joins the orchestra for what is popularly referred to as ‘The Humming Chorus”. Dawn is breaking as the curtain rises for part 2. Suzuki and the boy are asleep, but Butterfly is still keeping watch. When Suzuki awakes, she persuades the poor little "wife" to go upstairs to rest, which Butterfly does but only if Suzuki promises to wake her when Pinkerton arrives. Pinkerton, Mrs Pinkerton (Sian Meinir) and Sharpless appear and Suzuki, at first is full of joy, which soon gives way to consternation when she learns the truth. Pinkerton himself, seeing about him the proofs of Butterfly’s complete loyalty to him, realises the heartlessness of his own conduct (Oh, l'amara fragranza di questi fior,/ velenosa al cor mi va./ Immutata è la stanza | dei nostri amor). He cannot bear to face the situation and rushes away, leaving it to Sharpless to settle matters as best he can. Butterfly hears that people are below. Suzuki tries to prevent her coming down, but she appears expecting to find her husband. The pathos of the scene in which she learns the truth is hard to describe. There are no hysterics – that would be expecteda and Butterfly bears the blow, in what is an achingly beautiful scene. She even expresses the wish to Kate, Pinkerton’s “American” wife, that she may experience all happiness (Sotto il gran ponte del cielo/ non v'è donna di voi più felice./ Siatelo sempre; non v'attristatate per me), and sends word to Pinkerton that, if he will come for his son in half an hour, he can have him. When Sharpless and Mrs. Pinkerton leave, Butterfly mortally wounds herself with a sword belonging to her father. She reads out the inscription on the blade ("Con onor muore chi non può serbar vita con onore"). She drags herself over to where Dolore is playing with his toys and dies as Pinkerton enters to take his son away. However many times that I have seen or listened to Madame Butterfly it still maintains the power to affect. What makes it so unique as an opera; and what gives it its emotional intensity – with greater passion than even La Boheme – is the musical conceits that Puccini employed. The music does not pretend to imitate the oriental style (as the Impressionist composers could be accused of doing), instead Puccini aimed to fuse the two musical sources. The intermezzo illustrates this wonderfully with the orchestra capturing the pizzicato effect that one hears in Japanese traditional music, in particular Gakubu - click on this Kunai-sho Gakubu example. To western ears much Asian music can sound formal: lacking in the emotional intensity of Western (tonal) melody. 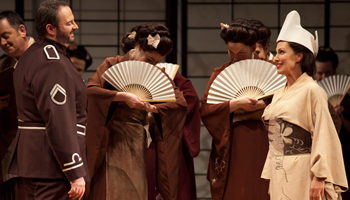 To Some extent the British composer Arthur Sullivan, had attempted a similar approach with The Mikado and the theme of Yamadori is so strongly reminiscent of the Mikado’s theme in Sullivan’s masterpiece. There are also two previous examples of operas that have a similar approach to Madame Butterfly: Meyerbeer's L'Africaine (1865) and Lakme, the Indian protagonist of Delibes's opera of that name (1883). Like Butterfly, both these characters belong to non-European races; like her both fall in love with a white man, and both commit suicide when their lovers desert them to return to their native lands. But whereas the older works seem to deal with the idea of a clash of cultures, in Madame Butterfly the role of ‘the people’ is not really central to the tragedy. Tradition in Madame Butterfly is more a consideration than a reason as to why the story is so effectively heart-breaking. Mosco Carner, in his Puccini: A Critical Biography suggests three reasons as to why Madam Butterfly is unique in Puccini’s operas. He says that although the opera appears to be melodrama there are elements of real tragedy in the plot. First we know that Butterfly is a geisha, she cannot be anything other than what she is. And so faced with only three alternatives: “marriage to Prince Yamadori, resumption of her former profession, or death she makes the most courageous choice”. Butterfly is also the only Puccini character that we see evolve from a child into a woman, and thirdly that the opera revolves around the psychological state of Butterfly. All other characters are simply a support to describing the inner world of Cio-Cio-San. And this last point is made clear by the fact that there is no real reaction from Pinkerton or any other to the death of Butterfly. The curtain falls with a group of people standing over her dead body. What I love about Puccini’s operas is the way that we are drawn in to the works. In Madam Butterfly our role seems no different from that of the characters on stage (with the exception of Cio-Cio-San): we are all observing the life and death of this pitiful character. And it becomes difficult to applaud when the music ends. Only once the curtain has fallen and then raised for the cast to take their bows, are we reminded that what we witnessed was not real life. It only resembled it.